Diageo’s new experimental Whiskey Union concept was unveiled this week as part of the multinational’s new strategy to strengthen its Scotch portfolio’s competitive edge. Will it pay off? And how far will the group need to venture outside its comfort zone? Becky Paskin investigates. Hopping mad? Will adding hops to Scotch whisky in products like Boxing Hares reignite enough interest in the category for Diageo? The rise of Bourbon and American whiskey in certain markets, the growing reputation of Japanese whisky, and a 9% decline in Diageo’s Scotch whisky sales in the last financial year (2014/15), has encouraged the group to break the mould. ‘This is how we will drive value – for our portfolio, for Diageo, and for the category as a whole,’ Gates observed. Whiskey Union has been devised – in just six months – specifically to address point four, while specific marketing plans and NPDs, such as its #LoveScotch social media platform, Johnnie Walker’s new Joy Will Take You Further campaign and a fresh ambition for The Singleton to take on the mighty Glenlivet and Glenfiddich malts, have been developed to address the remainder. Comprised of a series of ‘unorthodox’ bottlings, including a hops-flavoured ‘Scotch’ and a Scotch-Canadian-American hybrid, Whiskey Union is designed to capture new consumers who may be tempted to kick off their whisky adventure with another category. ‘A vibrant and exciting Scotch category is important for us and we have a strong pipeline of innovation on both our core portfolio and through new-to-world introductions,’ Gates added. The first two products to be released under the Whiskey Union banner are Smoky Goat and Boxing Hares, both of which are now available to purchase in Berlin, Hamburg, Munich, Vienna and at Amazon.de. Smoky Goat, a 40% abv blended Scotch whisky with a ‘beautiful sweet smoke’ flavour, is designed to target independent millennials who are new to the whisky category. With a recommended retail price of €24, Smoky Goat is positioned, like so many other Scotch brands these days, to rival the successful mainstream Bourbons on offer in Germany. 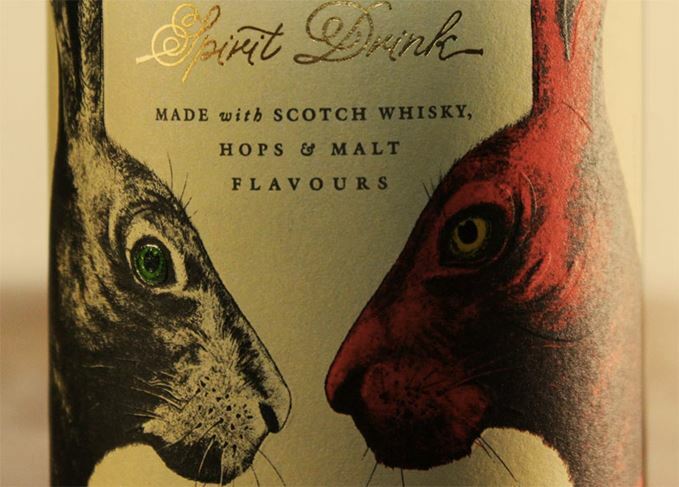 Boxing Hares, meanwhile, (€22) is a spirit drink made from Scotch whisky and hops ‘from craft beers’. At 35% abv it is still playing in the spirit arena, but is aimed at German beer drinkers who are considering crossing over into whisky. According to Diageo, consumers have so far responded well to mixing the product with lemonade, although bartenders are more keen on serving Boxing Hares as a shot. A third addition will be made in 2016 – a 40% abv hybrid whisky blend named Huxley that contains Scotch, American and Canadian whisky. Carrying a novel description of ‘rare genus whiskey’, the product is named after T H Huxley, an English 19th-century comparative anatomist and Darwinist. The concept, Gates said, is about ‘experimenting, testing and giving freedom to our makers’ imaginations and giving our consumers a range of completely different styles and personalities of whiskey’. 'Cool bartenders': Whiskey Union will be introduced to Germany's on-trade by a team of influential insiders. The fate of Whiskey Union then lies in the hands of a team of some of the ‘coolest’ bartenders in Germany and Austria, who have been selected to launch the concept in the local on-trade. Supported by a social media- and bar advocacy-oriented PR and marketing campaign, the team will be ‘critical’ to its success. Diageo has its reasons for placing the launch marketing campaign with a local team on the ground. ‘People’s trust in big institutions is being eroded,’ Gates noted. ‘They are putting their trust in human-scale endorsement, authenticity and transparency, and brands who share their values and contribute to their communities. These are all important implications for what we do and how we communicate; we need to be more personal, more human, more open and kill any BS.’ Consumers and the on-trade are, in Diageo’s view, more likely to listen to locally renowned, influential bartenders than corporate salespeople. As if to underpin Diageo’s determination to make the project work, Menezes added: ‘We cannot and will not be complacent about the growth of these [whisky] sub- categories. We have looked carefully at every aspect of these whiskies to see what we can learn to push ourselves harder and to raise our standards even higher.